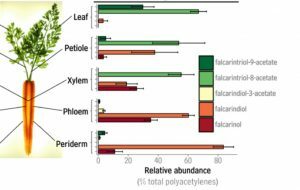 Polyacetylenic lipids accumulate in various Apiaceae species after pathogen attack, suggesting that they are naturally occurring pesticides and potential targets for crop improvement. These chemicals are also of interest because they exhibit cytotoxic activity against human cancer cell lines and slow tumor growth. Even though polyacetylenic lipids were discovered decades ago, the biosynthetic pathway underlying their production is unknown. To fill this gap in our knowledge, and with the ultimate aim of genetically engineering polyacetylene levels, Busta et al. (10.1104/pp.18.01195) studied polyacetylenes and their biosynthesis in carrot (Daucus carota). Recently, a carrot genome assembly was released that provides RNA-sequence data from diverse carrot tissues. In this issue, the authors provide a detailed gas chromatography-based quantification of polyacetylenes in carrot tissues for which RNA-sequence data is available and combined this information with bioinformatics analysis and heterologous expression to identify and characterize biosynthetic genes that underlie carrot polyacetylene biosynthesis. Polyacetylenic metabolites in extracts from five different carrot tissues, including leaves, petioles, root xylem, root phloem and root periderm, were quantified. Falcarindiol and falcarinol were the predominant polyacetylenic lipids found and they accumulated primarily in the root periderm. Since the multiple double and triple carbon-carbon bonds that distinguish polyacetylenes from fatty acids are often introduced by Δ12 oleic acid desaturase (FAD2)-type enzymes, the authors mined the carrot genome for FAD2 genes. The sequences and tissue expression profiles of potential FAD2 and FAD2-like genes annotated in the D. carota genome were compared with the metabolite data to identify six candidate pathway genes in the root periderm, followed by biochemical functionality tests using yeast (S. cerevisiae) and Arabidopsis (Arabidopsis thaliana) as heterologous expression systems. 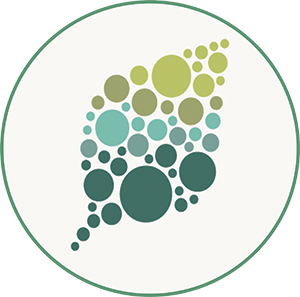 The genes identified can potentially be used to modulate polyacetylene levels in plants, and to test the function of these molecules in planta.